If I could hand out magic wands that parents could wave to instantly transform their child from fussy to unfussy eater, I would – and probably be exceedingly rich from it! But the Getting the Little Blighters to Eat approach is about as close to a magic wand as you’re going to get. It just takes a bit longer (though plenty of parents do report a change from the very first meal!). “But I just don’t think I’ve got the patience to wait the three or four months for it to work,” said one parent recently. The Getting the Little Blighters to Eat approach makes every single meal less painful and painstaking. It requires less, not more effort from you. You simply ‘Dish up, Shut up!’ and let the approach slowly but surely take effect. To help you stay motivated through the process and not fall back into old habits at mealtimes, my advice is to focus fully on any positive changes you notice in your child’s eating – however tiny! Even to note them down in a diary every day so that you have a more tangible record of the progress you are making. Here’s a brilliant ‘real life’ example from a family I am currently working with. 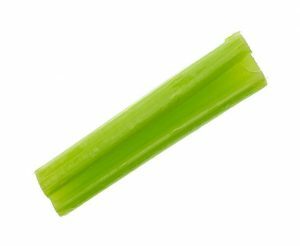 For clarity’s sake, I am going to focus on the child’s gradual change in attitude towards just one vegetable: a stick of celery! Starting point: The only vegetable this almost three-year-old child will eat is the odd bit of cucumber. Week 1: Mother completely stops putting any pressure on child to eat any of the foods on her plate from now on. Week 2: She presents child with a stick of celery in a ramekin to the side of her lunch (celery is going to make a regular appearance from now on, about once a week). Child looks at the celery and says, “Take it away mummy, take it away!” and gets upset. Mother says, “It’s okay, you don’t have to eat it.” Child calms down and allows it to be there. Week 3: Child looks at the stick of celery and says “What’s that?” Mother replies simply “It’s celery”. Child doesn’t comment. Week 4: Child picks up the stick of celery and puts it in her mouth and says, “Look mummy, look. I’m playing the trumpet! You do it too!” Mother does it too with her own celery. Week 5: Child picks up the stick of celery and takes a bite and completely finishes that bite (it takes a while – celery is quite hard work! – but the child persists happily). Child then takes a second bite of their own accord, but decides to spit this bit out. Mother makes no comment of course. Week 6: ??? We shall see…but it’s looking good, right?! 2. Acceptance (The child allows the food to ‘be there’ because they know there is no pressure to actually eat it). Now imagine this progress with a wide variety of foods all going on at the same time, and bingo! You’re well on the way to undoing fussy eating! MYTH #1: CHILDREN ARE NATURALLY FUSSY. WE JUST HAVE TO GRIN AND BEAR IT. Children can have an innate preference for and wariness of certain foods – but it is our behaviour and reaction to our children’s eating that has the most powerful impact of all! That is what determines whether they become a fussy eater or not. MYTH #2: IT’S JUST A PHASE. THEY’LL GROW OUT OF IT. Many children do grow out of fussy eating – but often not until they’re in double figures. That’s thousands of stressy mealtimes to get through before then. MYTH #3: I NEED TO FIND SOME GOOD RECIPES THAT THEY’LL EAT. Trying new recipes and offering your child different meals is great, but it’s not a case of finding the ‘right’ food. Fussy eating doesn’t start because they don’t like the food. It starts when they realise it gets them huge amounts of power and attention! MYTH #4: IT’S OKAY TO DO WHATEVER WORKS TO GET THEM TO EAT SOMETHING. Encouraging, pestering, nagging, praising or bribing your child may get a few more peas or spoonfuls of rice into them – one slow, painful meal at at time – but you’re simply inviting them to an ongoing power battle. One they can win more easily than you! MYTH #5: I NEED TO BUY CHILD-FRIENDLY FOOD. Your child may enjoy carrot from a squeezy pouch or be enticed by Peppa Pig pasta, but these type of foods give them the message that children don’t – or can’t – eat the same food as adults. So they encourage, not discourage fussy eating. MYTH #6: I NEED TO CUT OUT SNACKS SO THEY’RE HUNGRIER AT MEALTIMES. This can make for one miserable, difficult-to-manage child in the lead-up to lunch or dinner – and therefore make mealtimes worse, not better. MYTH #7: I NEED TO MAKE FOOD FUN. A good dose of fun around food is a positive thing but making smiley faces with veg on top of a pizza or shaping mashed potato into a hedgehog won’t solve fussy eating. Kids soon twig that it’s just another way of trying to get them to eat something! MYTH #8: THERE’S NO POINT IN GIVING MY CHILD A FOOD I KNOW THEY WON’T EAT. IT JUST GETS WASTED. MYTH #9: HIDING VEG IN A PASTA SAUCE OR SOUP IS THE ONLY WAY FORWARD. If we don’t give our children the opportunity to see and get used to vegetables ‘in the flesh’, we have no hope of them eating them. Adding veg to recipes for extra goodness is fine, but don’t do it as alternative to presenting vegetables boldly and proudly. MYTH #10: I JUST NEED SOME REALLY GOOD TIPS. There is no magic wand you can wave to stop fussy eating overnight. But ‘starting again’ with a fresh new approach at mealtimes, if put into practice with a 100% consistency and commitment, will work – and with a typical fussy eater usually only takes a few months. What’s that in the timescale of a whole childhood?! Or what to do when your child asks to try a food you think is unsuitable for them! WARNING: This’ll make your eyes water! 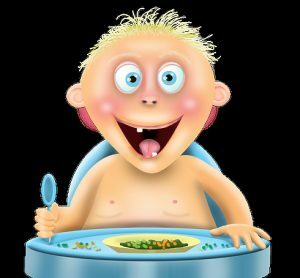 Those of you who have read the introduction to Getting the Little Blighters to Eat will know that my own childhood memories of mealtimes are not pleasant ones! I’d like to share another story from those times with you here – one with a moral to the tale. 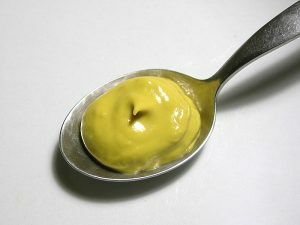 With certain meals, like sausages or liver and onion, my mum and dad liked to have mustard – you know, the classic, strong, yellow Colman’s stuff. Now one dinner time, my little brother, then two years old, became very curious about that little mysterious yellow pot on the table. “I want some!” he said. But he pestered and pestered and pestered … until eventually my dad grabbed the pot, opened it, scooped out a whole teaspoonful and offered it to him. My little brother, delighted, opened his mouth wide and eagerly took in the whole lot. You can imagine what happened next: Red face, spluttering, coughing, nose streaming, eyes streaming…, and tears, real tears with awful, inconsolable sobbing that lasted a long, long time. Not just because of the burning sensation in his mouth, but because of the betrayal of it all. “That’ll teach you,” said my dad. “We told you!” said my mum. Was it cruel? Yes. Did it kill his curiosity in new foods? Yes. He was going to be very wary about trying new foods in the future. Did it kill his trust in food? Yes – and almost certainly his trust in my parents too! So should they have stopped him trying it? No! Should they have done it differently? You bet! Here’s the dos and don’ts of what to do when your child asks to try a new food that you think is unsuitable for them? Stop them trying anything! We want them to be curious and open-minded and adventurous about food. That’s what non-fussy eating is, right?! Say “I don’t think you’ll like it” as you give it to them . Put no negative thoughts in their head whatsoever! Let them make their own minds up. They may love it! Say “It’s only for grown-ups” or “It’s not for children”. We don’t want to teach them that children should eat – or are only capable of eating – bland foods. Obliterate the line between “children’s food” and “adults’ food”. This is mostly a modern, marketing idea pushed by food companies so that they can sell us more products like turkey dinosaurs and squeezy tubes of yoghurt! Make a big thing of it if they reject, spit out or say they don’t like the food – or say “I didn’t think you’d like it”. Deal calmly with any mess and say nothing! You want them to be open to trying it again in the future. Curiosity about food (and the whole world!) is a natural, normal trait in little humans. Let’s do everything we can to keep it alive!